The Seine makes a slight bend to the left after the Pont de la Concorde. The next river crossing is the elegant Pont Alexander III that we previously studied on February 15th. The bridge was named after a Russian tsar and completed in 1900 to commemorate the Franco-Russian Alliance of 1892 that was created to counter the threat from Germany that eventually led to WWI. Another bridge (designed by Gustav Eifel) was built in Saint Petersburg to commemorate the alliance. Russian novels like War and Peace illustrate how the Russian nobility looked to France for fashion and culture, even while they were fighting Napoleon. Thus, Imperial Russia and Republican France were natural allies. We can also see that bridges in Paris are meant to make important political statements as well as to carry traffic across the Seine. I think that the Waterloo Bridge is the only bridge in London named for anything other than the area where it was built. 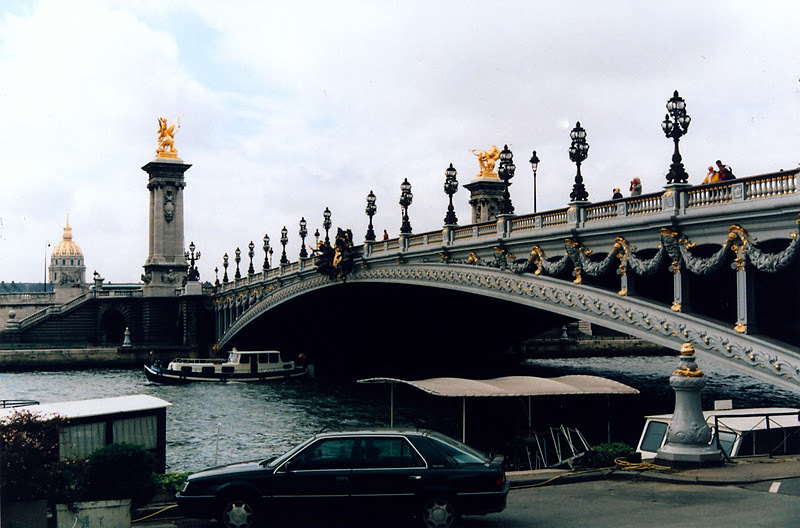 The Pont Alexander III is highly decorated and surrounded with golden statues. The giant pedestals at the ends of the bridge were actually built as counterweights to help balance the arch. It must take a large maintenance staff to keep all of that shiny metal clean and polished. Seine River Bridges: Pont Alexander III (2) by Mark Yashinsky is licensed under a Creative Commons Attribution-NonCommercial-ShareAlike 3.0 United States License.